Robert Schmit, Eugène Boudin, Paris 1973, vol. III, p.100, no.2839, illus. Eugène Boudin is best known for sparkling beach scenes painted in the Normandy resorts of Trouville and Deauville, a motif which he explored with great subtlety from the early 1860s to the mid-1890s. Boudin was born in Honfleur, the son of a sailor, so the sea was in his blood. After studying in Paris from 1847 to 1854, he returned each summer to his beloved Normandy coast, sketching and painting from nature. Winters were spent in his Paris studio preparing works for exhibition. The fishing village of Trouville was visited by the artist Charles Mozin in the 1820s and became a summer haunt of painters such as Eugène Isabey and Jean-Baptiste-Camille Corot, as well as the writers Alexandre Dumas Père, Alfred de Musset and Gustave Flaubert. Comte Alphonse d’Hautpoul bought land there in 1842 and encouraged an influx of aristocratic visitors. The opening of the railway in 1863 put Trouville within six hours’ reach for the Parisian haute bourgeoisie, while the efforts of the Duc de Morny continued the development of the town, which boasted elegant hotels, villas and a casino. In 1831 Dumas, not yet the celebrated author of The Three Musketeers (1844), wrote of Trouville ‘se composait alors de quelques maisons de pêcheurs groupées sur la rive droite de la Touque[s]’, where he fished and explored the coastline. By 1868, to his delight, ‘Trouville est devenu le bain de mer à la mode….Je devais être fier de voir grandir Trouville’, a place which he regarded as his own discovery. In 1881 Boudin was taken up by the influential art dealer Paul Durand-Ruel and his prosperity improved. In 1884 he built ‘une petite cage hollandaise’, the Villa des Ajoncs, at Deauville, the quieter resort on the opposite side of the river Touques from Trouville, which provided a summer refuge for painting expeditions until his death. 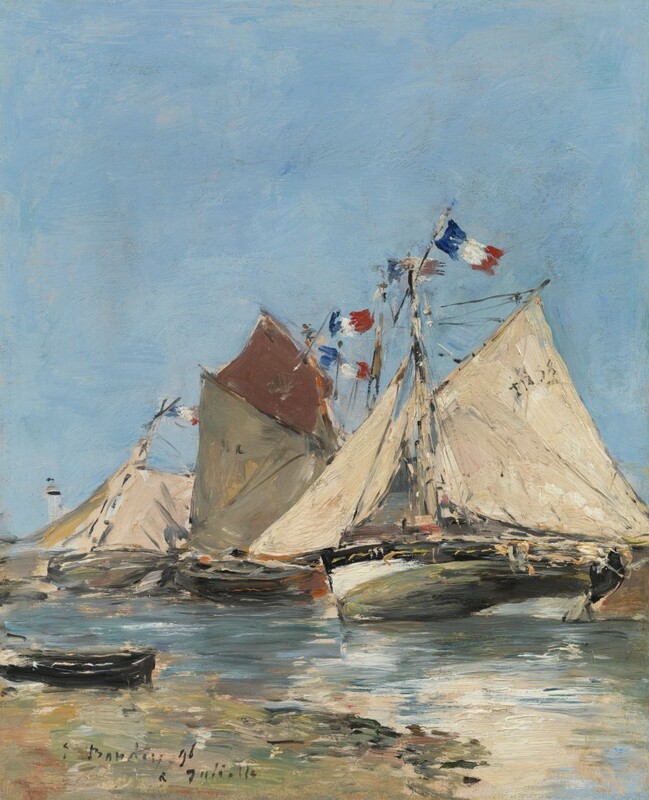 Trouville – bateaux échoués depicts a favourite theme of Boudin, fishing boats beached at low tide. He was fascinated by the shape of the boats’ hulls and sails as they lean in the shallow water and by the play of sunlight and shadow on the cream and ochre canvas. The water reflects the colours of the boats beneath a sky of brilliant blue. By the 1890s Boudin had abandoned the more deliberate, blocklike application of paint of his early manner in favour of flickering brushwork influenced by his younger colleagues the Impressionists. As he had first inspired Monet to paint from nature, so did his former pupil inspire Boudin, that most open-minded and youthful-in-outlook of artists. Boudin often dedicated his paintings to friends and clients. This work is inscribed to Juliette Cabaud, a governess with whom Boudin formed a relationship after the death of his beloved wife Marie-Anne in 1889. On the back of the panel is written ‘Juliette Boudin’. The relationship sustained and comforted Boudin’s later years, and the couple explored new places together, including a visit to Venice in 1895. Venice provided an invigorating new motif for Boudin and several of his Venetian paintings are also dedicated to Juliette. By the 1890s Boudin’s financial struggles were behind him, but he never ceased to take delight in the world and to wish to capture it in paint. Trouville – bateaux échoués is a lively and charming depiction of the central motif of his existence – the sea – presented by a humble, affectionate man to the last love of his life. Eugène Boudin was one of the most important precursors of the Impressionists, with his emphasis on working directly from nature and free, naturalistic brushwork. His ‘Crinolines’, depicting fashionable holidaymakers enjoying the beaches of northern France, ushered in a new genre, but he was also renowned for coastal and harbour scenes. Born in Honfleur, Boudin was the son of a harbour pilot and bred to the sea, working as a cabin boy for his father in his boat Le Polichinelle. After a brief period of schooling, in 1835, he worked with a stationer and framer who displayed the work of artists, then set up his own stationery and framing business in 1844. Boudin’s clients included Thomas Couture, Eugène Isabey, Jean-François Millet and Constant Troyon, all of whom had an influence on his efforts to draw and paint. In 1847 Boudin went to Paris to copy Old Masters in the Louvre; he was particularly impressed by the seventeenth century Dutch school and by the Barbizon painters. In 1851 he was awarded a three-year painting scholarship by the city of Le Havre. He drew his subjects from the Normandy and Brittany coasts. In 1858 he met the young Claude Monet, who had grown up in Le Havre, and stressed to him the importance of making oil paintings directly from nature to capture the constantly changing beauties of the landscape. Boudin and Monet went on painting expeditions together, especially at the Saint-Siméon farm near Le Havre. Boudin made his debut at the Salon in 1859, where his work was admired by Charles Baudelaire. He befriended Courbet, Daubigny and Corot, who heralded him as ‘the king of the skies’. Paris-based in the winter, Boudin spent his summers on painting tours around the coast of Le Havre, Honfleur and Trouville, inspired by the elegant society that flocked to the burgeoning seaside towns and by the busy maritime traffic. At Trouville in 1862 he met Johan Barthold Jongkind and, influenced by his boldness of technique, adopted freer brushwork and a brighter palette. The following year he married a Breton woman, Marie-Anne Guédès. Boudin made several journeys to Belgium and The Netherlands, initially to shelter from the Franco-Prussian War (1870-71). From 1892 to 1895 he visited Venice, making subtle, atmospheric and highly individual views. He also painted in the south of France at Antibes, Villefranche and Beaulieu, where he stayed in the 1890s for the health benefits of the mild winter climate. Boudin exhibited at the Salon from 1863 to 1897 and participated in the First Impressionist Exhibition in 1874. From the 1870s Boudin enjoyed increasing financial security. In the 1880s he was taken up by the influential art dealer Paul Durand-Ruel, the champion of the Impressionists. Durand-Ruel organised exhibitions of his pictures in 1883, 1889, 1890 and 1891. In 1892 Boudin was awarded the Légion d’Honneur. He died in Deauville in 1898. Works by Eugène Boudin can be found in the many museums worldwide including The National Gallery of Art, Washington DC; The Metropolitan Museum of Art, New York; The National Gallery, London; Musée d’Orsay, Paris; Musée du Louvre, Paris and The Hermitage, St Petersburg. Mes mémoires, quoted in ‘Alexandre Dumas à Trouville’, La Société des Amis d’Alexandre Dumas, www.dumaspere.com. ‘Causeries sur la mer’, Moniteur universel du soir, 24th August 1868, quoted in La Société des Amis d’Alexandre Dumas, op. cit. For example Venise, le mole à l’entrée du grand canal et la Salute, dated 20th June 1895 (Art Gallery and Museum, Kelvingrove, Glasgow).